When the enemy is in close pursuit, there’s not a lot of time to decide what’s next. Fighter pilots are trained to make decisions fast. It’s a decision that could mean life or death. And fast is not enough. Fighter pilots must make fast and accurate decisions. Decision-making is critical in innovation too. Freezing, making the wrong move, or having a slow process for decision-making can mean endgame. A competitor will swoop in and take over, leaving you in the dust. What works for fighter pilots may work for you. It’s called the OODA Loop. 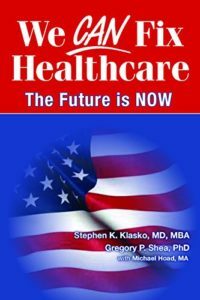 Continuing the series on innovation leadership skill sets, this show addresses a question from a number of listeners. The question centers on decision-making. 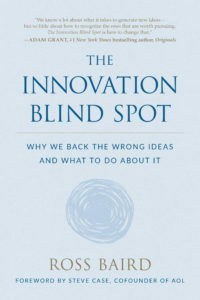 You’ve been trying to stand up an innovation effort in your organization. But, the decision process through the organization is slow. How can you speed up decision-making? What has worked for me over the years is the OODA Loop. It’s a military framework for decision-making. A military leader developed the OODA Loop to train pilots to make swift, critical decisions. The OODA Loop helps pilots in crisis situations. It trains them to avoid rote thinking and solve immediate problems creatively. This decision-making framework translates well beyond the military. It has had wide use across business, industry, and organizations. 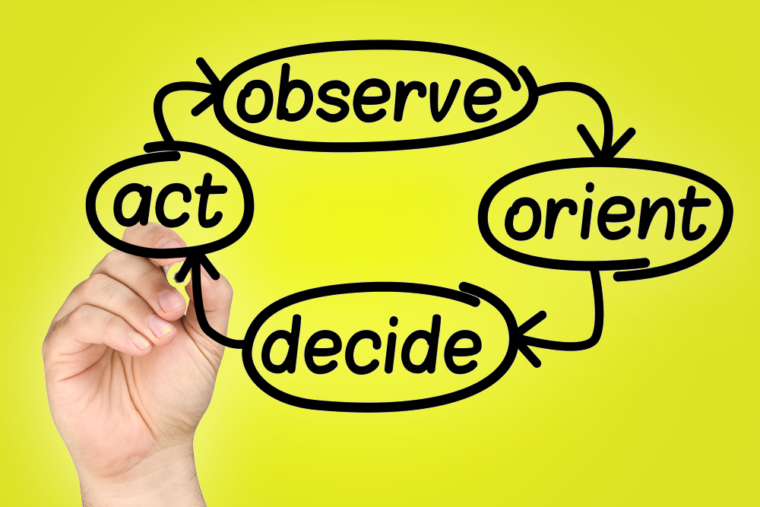 OODA stands for Observe, Orient, Decide, Act. These are the steps to take to making fast and accurate decisions. The Loop is the repeat of the steps until you arrive at the solution. The OODA loop guides you to look and evaluate a variety of things, test them, and act on them. Based on the result, you go back through the OODA loop again until you can get to a solution. Each time you go through the loop, you add what you learned from the last loop. If your first run through the OODA Loop doesn’t resolve the issue, on the next Loop, you know what to change. Rapidly gather as much information as possible accurately. This will never be complete, but don’t let that delay you. Keep in mind that you need to cycle through the OODA Loop very fast. Don’t stay in any one step of the Loop for any length of time. The quick- paced, continuous loop improves decision-making. With each cycle, it’s a feedback mechanism. I’ve used the OODA Loop with many teams and projects. For a number of reasons, I like using the OODA Loop. In nearly every innovation project, there’s a point where things freeze. The OODA Loop helps teams break free of that state. It forces teams to do something continuously. It is a fast and accurate way to decision-making. Good teams will cycle through the OODA Loop to action in minutes. Teams learn to accept that and move on with the data at hand. The fast pace and unique synthesis of data creates an unpredictable output. This will baffle the competition. Using a framework such as the OODA Loop, you can reach fast and accurate decisions. What’s worked for fighter pilots in intense dogfights can help you to keep ahead of your competitors and win in the innovation game. Business is always evolving. The pace of that evolution is only getting faster. To keep ahead, ask the right questions and think the impossible. While at HP, I had the chance to talk with will.i.am of Black Eyed Peas. He asks questions and explores what could be the future music experience. What about your industry? What will it be like in five years? Neglecting to look ahead could lead to a Sputnik moment. Listen to this week’s Five Minutes to New Ideas.to spark your thoughts on what the future holds. Thanks for taking time out of your busy schedule to listen to the show. If you have any questions or comments, drop me a note. If you’ve enjoyed the show, would you do me a favor? Rate the show wherever you get your podcast.